B.Sc., Aeronautical Engineering, University of Kansas, 1955. Served as a USAF fighter pilot at George AFB, California. Graduate, USAF Experimental Test Pilot School and the USAF Aerospace Research Pilot School. 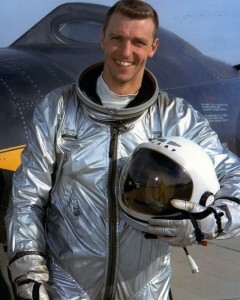 From 1963 until selection by NASA, Test Pilot in the X-15 rocket-plane research project at Edwards AFB, California where he earned his USAF Astronaut Wings by exceeding an altitude of 80,000 meters in 1964. Completed 16 missions, 3 of which exceeded 80,000 meters. 1971, replaced as Lunar Module Pilot for the final Apollo mission by Geologist Jack Schmitt who was the back-up LMP for Apollo 15. 1977, From June to October, CDR of one of two crews to fly the Space Shuttle Approach and Landing tests aboard the Space Shuttle Enterprise. STS 2, November 12-14, 1981, CDR of the second orbital test flight of the Space Shuttle Columbia, the first vehicle to enter space a second time. 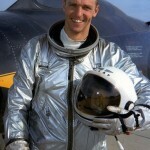 Joe Engle became the only CDR of a Space Shuttle mission without having flown in space with NASA. From March to December 1982 served as Deputy Associate Administrator for Manned Spaceflight at NASA HQ while maintaining his flight status. Returned to JSC in January 1983. STS 51I, Aug 27-Sep 3, 1985, CDR of Discovery during the deployment of 3 communications satellites and the retrieval, repair and re-release of another. Retired from NASA and the USAF and was appointed to the Kansas Air National Guard, recieving a promotion to Brigadier General. Worked as an Aerospace & Sporting Goods consultant. Returned to NASA as part of the Stafford-Utkin Task Force, responsible for resolving Shuttle-Mir hardware and operations issues in 1994.